"How To Summerize Your Roses"
The first bloom of the spring is now over. In the San Joaquin Valley we've had an extremely cool and long dry spring. Because of the dry and windy spring spider mites have already arrived causing roses to defoliate. We should be having 80-90 degree days by now but we've only been having days in the 60's to low 70's. For the next few months it's now time to sit back and enjoy your garden. With a few summer rose growing tips you can keep your rose bushes healthy for the long, hot summer ahead. We didn't get much of a break this spring trying to keep the black spot, powdery mildew and insects under control. 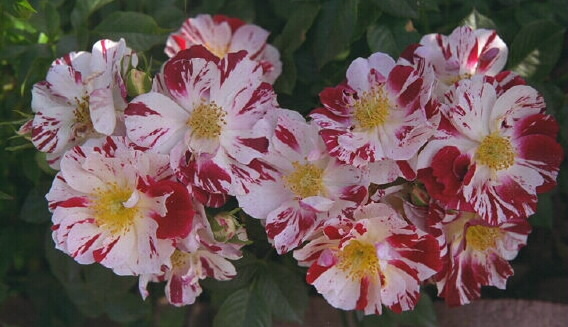 If you sprayed and it didn't control the diseases you may just want to cut back your roses. Don't cut back too severly-just enough to cut off the diseased leaves. You may be able to cut the diseased leaves off when you cut off your spent blooms. 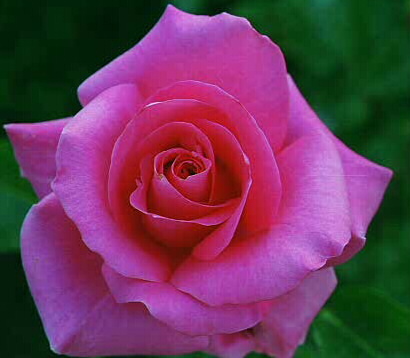 You will cut off old rose blooms about every six weeks on most roses. One time blooming old garden roses are usually cut off after they have finished their bloom in late spring to early summer. Don't be surprised if your summer blooms are much smaller than your first blooms of spring. The heat does affect the size of the bloom. 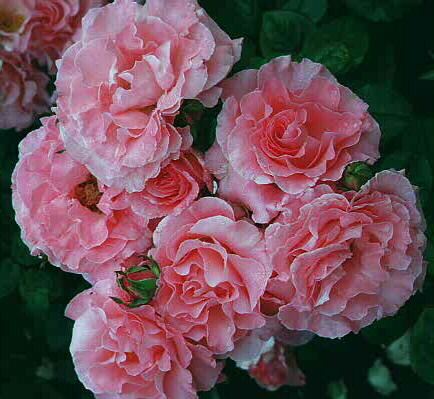 Extra water and fertilizing will not increase the size of your roses. Roses in the valley in the summer just need to be maintained in good condition so they can produce a nice fall bloom when the weather is cooler. If you haven't had any insect problems you've been lucky. Plants that have been stressed out from fungal diseases are more susceptible to insect problems. At the beginnig of the second bloom cycle, be on the alert for the Raspberry Horntail. The new growth will bend over and die. He has laid his egg in the new stem and it hatched and feds on the new, tender growth. Prune below the wilted stem and destroy it. The wilted stem had the worm in it and by cutting it off will stop it from repeating it's cycle all over again. Most insects can be controlled with a pesticidal oil or insecticidal spray or soap. During our hot, dry summer months, spider mites will be appearing and is the biggest problem I have in my garden. Look for lower leaves on your plants that may be duller in color than the rest of the bush, have a grayish appearance or yellow. The leaves will also start curling because of the moisture the mites have taken out of the leaves. 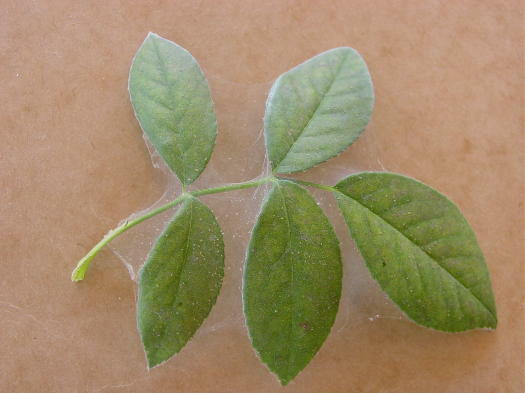 Spider mites are extremely hard to control and there are few controls that are affective. 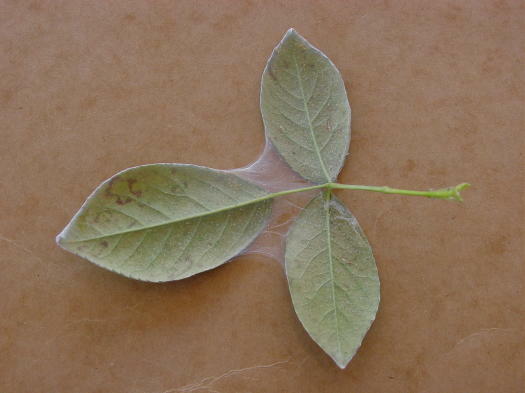 If you look on the underside of the leaves you can see the webbing they leave. Water is probably the most affective control. By hosing off your bushes two or three times a week will help break the cycle of the spider mites. If you don't see the mites in time your bush can completely defoliate. If this happens it is very hard for your bush to recover in the summer without leaves. Because spider mites thrive on dry, hot weather it is important to water your roses on a regular schedule. During the summer feed your roses on a regular schedule. 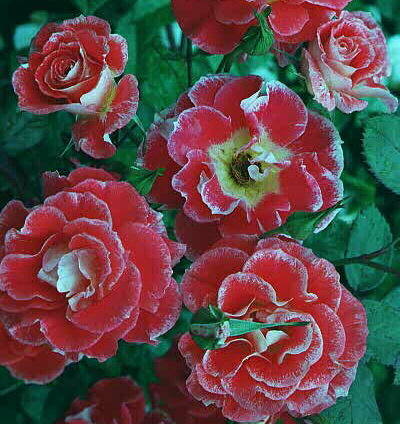 With the stress from the hot summer you want your roses to be in the best possible condition. Lots of water will be needed too. Remember, if you're going to spray your roses with an insecticide or pesticide or are going to feed your roses be sure that your bushes have had a good deep watering. This should prevent any buring of the edges of your rose leaves. Mulching is an important part of summer care for your roses. 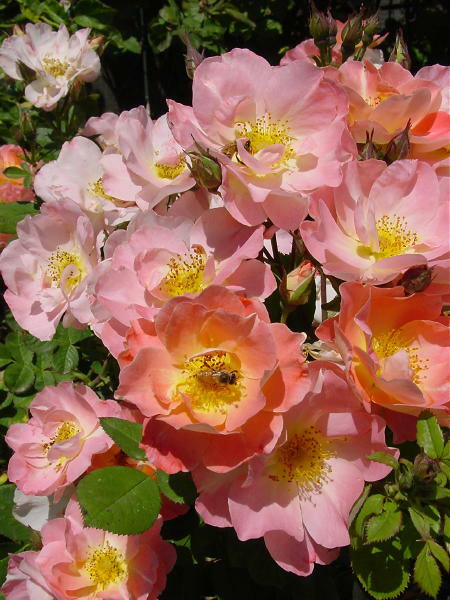 Not only will it help retain moisture in your rose beds, it will also help with weed control. Lots of materials can be used for mulching and it's another way to help relieve your roses from summer stress. 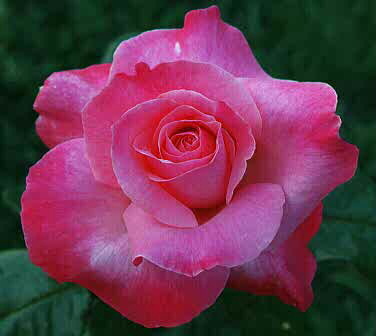 During the next few months watch your roses for insect and disease outbreaks, give them lots of water and feed them on a regular schedule. All of these things will help your roses maintain their growth and be ready for a beautiful fall bloom.